Terry Ferrell’s passion has seen the everyday now revered as art. 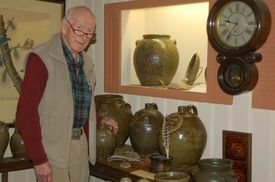 One of the most important collections of pre-Civil War Southern pottery goes under the gavel today when Wooten & Wooten Auctioneers and Appraisers sells the Ferrell Collection in Camden, S.C.
Terry Ferrell, a 92-year-old preacher, collector and pottery historian, will be present as 92 pieces of his family’s lifetime collection of 19th-century Edgefield pottery is auctioned piece by piece to the highest bidder. The pottery was made in the 1800s in the old Edgefield District of South Carolina, an area that encompassed several counties around modern Edgefield County, about 170 miles east of Atlanta. Museums, well-heeled collectors and folk art dealers will vie in person, over the telephone and on the Internet for the ceramic “pots,” some of which could bring big bucks. One 1850s water cooler signed and decorated by Thomas Chandler could fetch $60,000 to $90,000, according to pre-sale estimates. It likely sold for about a dollar when Chandler made it: The utilitarian crocks sold for about 10 cents to 12 cents a gallon in their day. 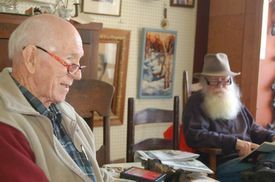 Ferrell said recent health problems and his advancing age convinced him he should sell the collection, which he and his son, Steve, have been amassing and refining since the the 1960s. At that time the crockery was considered junk and could be bought for a few dollars at yard sales and flea markets. But Ferrell and his son — himself a master potter — felt there was something unique and exceptionally beautiful about the “pots and jugs.” They began not only acquiring them but researching their history and the people who made them. They wrote and lectured about their findings. Museums soon borrowed their collections for shows. Steve Ferrell would often load dozens of pieces into his car and travel to universities and museums around the South to discuss what he and his father had discovered. 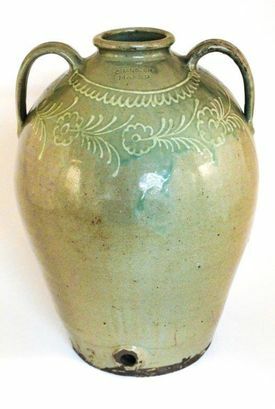 The Ferrells helped confirm that the Edgefield potteries were a crossroads in clay, where English, African and Asian pottery techniques and glazes combined to create ceramics unique to the United States. One of Edgefield’s most famous potters was a slave who sometimes signed his pots “Dave” and occasionally scratched poems on the side. There are several Dave pieces in the Ferrell sale. 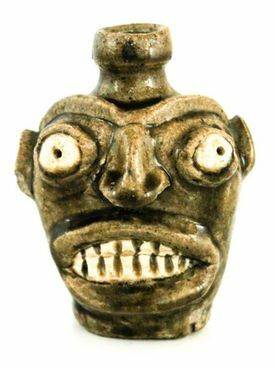 “The significant difference between the Ferrell Collection and any other collection is that this is a lifetime study collection,” said Philip Wingard, who describes himself as a “ceramic historian and pottery broker”. Experts say the Ferrell collection is exceptional because the father and son collected not only unique decorative items but historical items as well. “The auction people told me they had trouble getting estimates on some of it because it is so unique they had no precedents to go by,” Terry Ferrell said. As the significance of Edgefield pottery slowly emerged, prices began to escalate. They moved from a few dollars per piece to hundreds per pot and then soared into the thousands and tens of thousands as collectors around the globe began to compete. “People who know a lot about antiques thought we were foolish back in the ’70s for paying $100 for a piece,” Ferrell said. This entry was posted in Edgefield Pottery by leonardtoddconversations. Bookmark the permalink.